Off-road vehicles can be a fun and exciting experience for the whole family. Who wouldn’t want the opportunity to own their own ATV to enjoy whenever they please? As enticing as this may be, these vehicles aren’t always as affordable as we might like. Some ATV’s can cost upwards of 10 thousand dollars. That’s why the Hammerhead GTS 150 was made, to cater to those who want everything an ATV can offer without having to break the bank. 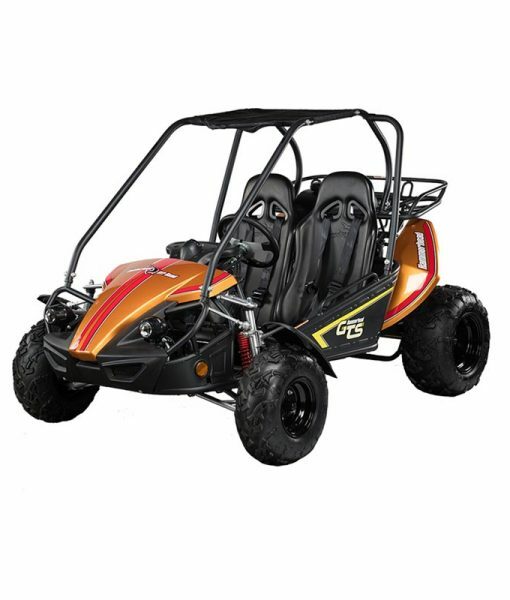 The GTS 150 is as reliable as any typical ATV with as many features as you could wish for. The adjustable seats and steering wheel allow you to maintain maximum comfort while driving. It’s a two-seater vehicle as well, so feel free to bring a friend along for the ride! The vehicle is electric start with headlights allowing you to keep driving past dusk. Also included are rack and pinion steering for versatility, automatic transmission, and front independent suspension for superior handling. Choose from multiple paint colors included with a black canopy top. If you’re looking for the right kind of ATV to fit your budget, then the GTS 150 can definitely meet your needs. Hammerhead Off-Road is an industry leader in off-road vehicles with a passion for reliable quality and service. You can rest assured that you won’t be sacrificing anything just from purchasing a less expensive product. We put the same amount of care and passion into all of our vehicles, which is why we’ve made it as far as we have in the industry. At Hammerhead Off-Road, we’ve been distributing ATV’s and Karts since 2003. We are dedicated to providing high-quality products that are readily available with outstanding customer service. Visit us here to learn more and to see everything we have to offer.